Reading and share top 20 famous quotes and sayings about Fractures by famous authors and people. Browse top 20 famous quotes and sayings about Fractures by most favorite authors. 1. "He looks at me, the light in his eyes fractures into millions of bits—a kaleidoscope of darkness that may never be fixed." 2. "You know, life fractures us all into little pieces. It harms us, but it's how we glue those fractures back together that make us stronger." 3. "So go ahead. Do it—open the book. See? You see me, right? And I see you. See? I am reading your face, your eyes, your lips. I know the sufferdust on your brow. I can see you reading and I can tell, too, when you are here, when you're absent, what you've read and how it affects you. There is no more hiding. I see your chords—your fractures, your cold gifts, where and when you've hurt people and why. It's all right there—your stories are written right there on your face!" 4. "Every you, every me. Fractals. Fractures." 5. "J'ai tenté d'être face à elle un homme fort conscient de ses faiblesses, un homme vêtu qui ne craint pas sa nudité, un homme droit qui connaît ses courbes et ses fractures. Tout ce chemin que j'ai fait pour la rencontrer m'a permis de me parcourir moi-même, c'est long de se parcourir." 6. 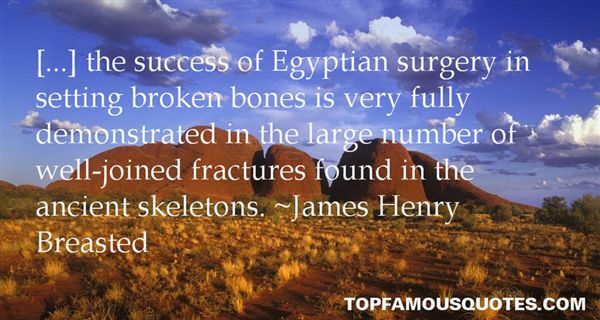 "[...] the success of Egyptian surgery in setting broken bones is very fully demonstrated in the large number of well-joined fractures found in the ancient skeletons." 7. "A heart with so many stress fractures would never be anything but broken." 8. "People care about animals. I believe that. They just don't want to know or to pay. A fourth of all chickens have stress fractures. It's wrong. They're packed body to body, and can't escape their waste, and never see the sun. Their nails grow around the bars of their cages. It's wrong. They feel their slaughters. It's wrong, and people know it's wrong. They don't have to be convinced. They just have to act differently. I'm not better than anyone, and I'm not trying to convince people to live by my standards of what's right. I'm trying to convince them to live by their own." 9. "She thought of Aziza's stutter, and of what Aziza had said earlier about fractures and powerful collisions deep down and how sometimes all we see on the surface is a slight tremor." 10. "Mysteries of attraction could not always be explained through logic. Sometimes the fractures in two separate souls became the very hinges that held them together." 11. "As we may know, osteoporosis affects around 10 million Americans, most of whom are over 55, and it is the cause of an estimated 1.5 million fractures annually." 12. "I think fractures in your childhood make you observe the world more as an outsider. Possibly it pushes you outside." 13. "The only obsession everyone wants: 'love.' People think that in falling in love they make themselves whole? The Platonic union of souls? I think otherwise. I think you're whole before you begin. And the love fractures you. You're whole, and then you're cracked open." 14. "Worship me, she says, worship the mistery of the bleeding goddess, and you do it. You stop at nothing. You lick it. You consume it. You digest it. She penetrates you.What next, David? A glass of her urine. How long before you would have begged for her feces? I'm not against it because it's unhygienic.I'm not against it because it's disgusting. I'm against it because it's falling in love. The only obession everybody wants: 'love'. People think that in falling in love they make themselves whole? The Platonic union of souls? I think otherwise. I think you're whole before you begin. And the love fractures you. You're whole, and then you're cracked open. She was a foreign body introduced into your wholeness. And for a year and a half you struggled to incorporate it. But you'll never be whole until you expel it. You either get rid of it or incorporate it through self-distortion." 15. "Everything in physiology follows the rule that too much can be as bad as too little. There are optimal points of allostatic balance. For example, while a moderate amount of exercise generally increases bone mass, thirty-year-old athletes who run 40 to 50 miles a week can wind up with decalcified bones, decreased bone mass, increased risk of stress fractures and scoliosis (sideways curvature of the spine)—their skeletons look like those of seventy-year-olds. 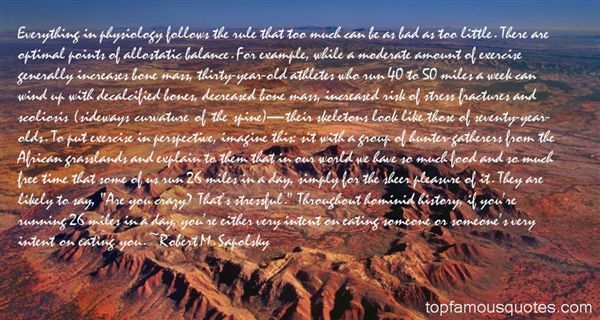 To put exercise in perspective, imagine this: sit with a group of hunter-gatherers from the African grasslands and explain to them that in our world we have so much food and so much free time that some of us run 26 miles in a day, simply for the sheer pleasure of it. They are likely to say, "Are you crazy? That's stressful." Throughout hominid history, if you're running 26 miles in a day, you're either very intent on eating someone or someone's very intent on eating you." 16. "Our hearts may have broken in Nebraska but in Colorado they split open along the fractures, crumble to pieces, blow away. The peaks and green valleys, the lakes set at the foot of mountains like offerings. Beautiful and doomed and thus terrible." 17. "Her heart was finished. It bore, perhaps, records of life, but it wasn't alive. Too late for decoration. Too late for effects. Further handling could only result in cracks and fractures. People could cut themselves on the edgesof her heart, she was sure of it." 18. "Some days I wake upand all I feelare the fracturesin the flesh that coversthe only meI've ever known.Some days,it's those exact fissuresthat let the lighthiding inside mepour outand coverin goldeveryonethat found enough beautyin the cracksto standclose." 19. "In our day, there are stresses and fractures of the human-animal bond, and some forces at work would sever it once and for all. They pull us in the wrong direction and away from the decent and honorable code that makes us care for creatures who are entirely at our mercy. Especially within the last two hundred years, we've come to apply an industrial mind-set to the use of animals, too often viewing them as if they were nothing but articles of commerce and the raw material of science, agriculture, and wildlife management. Here, as in other pursuits, human ingenuity has a way of outrunning human conscience, and some things we do only because we can--forgetting to ask whether we should." 20. 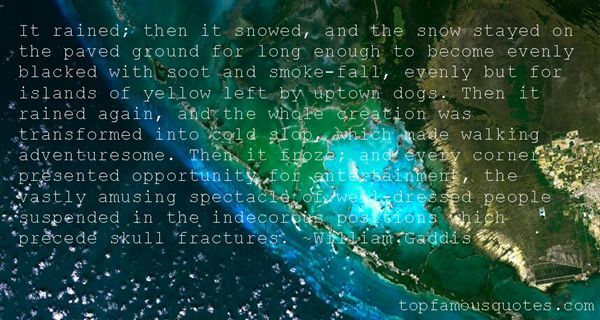 "It rained; then it snowed, and the snow stayed on the paved ground for long enough to become evenly blacked with soot and smoke-fall, evenly but for islands of yellow left by uptown dogs. Then it rained again, and the whole creation was transformed into cold slop, which made walking adventuresome. Then it froze; and every corner presented opportunity for entertainment, the vastly amusing spectacle of well-dressed people suspended in the indecorous positions which precede skull fractures." Before Elle had come into his life, he didn't even know what tea was. Now it was a staple. Worse, he actually knew the differences in teas."